From 1915 to 1993 Leederville Oval was the home of the West Perth Football Club. Under urging from the WAFC, the Falcons moved to the northern suburb of Joondalup in 1994. There was talk of the ground becoming the WAFC headquarters and a training venue for the West Coast Eagles or Subiaco. 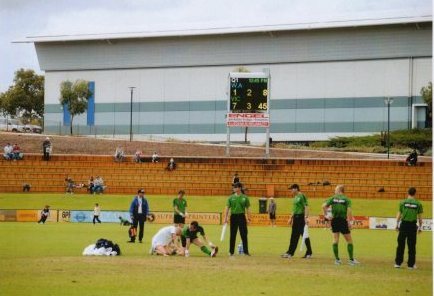 Now Leederville Oval is the home of West Perth’s bitter rival East Perth (who were eased off their home ground Perth Oval by soccer club Perth Glory) and Subiaco (lured away from Subiaco Oval). The Falcons have won three premierships since the move – 1995, 1999 and 2003 – but the move hasn’t been a total success. A big problem for WPFC is that making money out of home games at Arena Joondalup is nearly impossible – late in 2010 they played a home game at Bassendean Oval (home of Swan Districts) so they could make some dough. Photo by Stanley ‘Digger’ Roberts, of the North Ballarat Football Club. Leederville Oval hosted the state game in 2010 between the WAFL and the VFL. The visitors got off to a flying start. The current scoreboard is one of those digital things and that means you often glance up at the board and see an advertisement rather than the score. 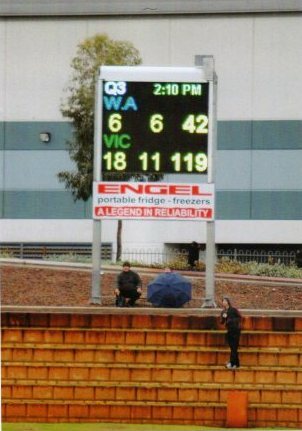 Western Australian fans seek shelter from the Big V defeat in May 2010. Photo by Digger Roberts. As one of the 5767 at the recent Perth derby I’m sad to report that the Mighty Royals unfortunately lost and that this scoreboard was non-functioning for the entire second half! Try watching a footy game where one team is slowly catching up and you don’t know the score or how much time has elapsed. 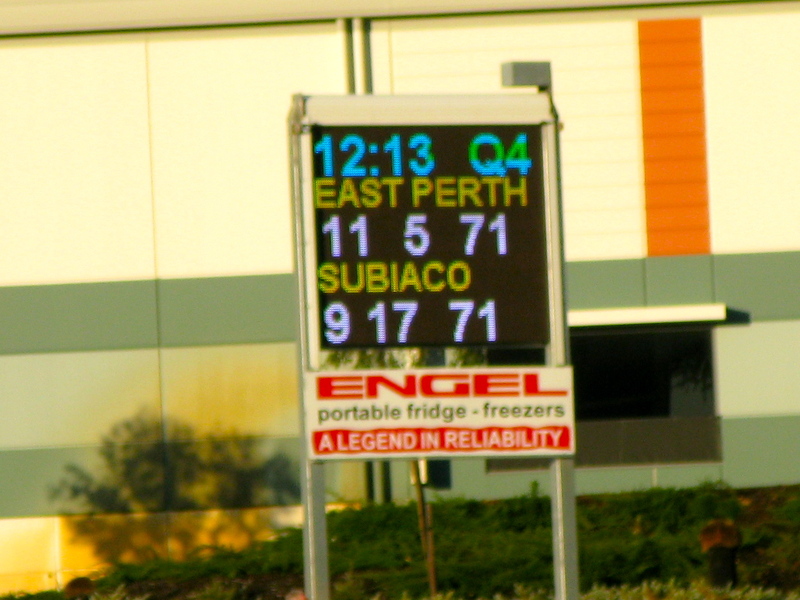 It’s unbelievable that any game (let alone a WAFL game) can’t/doesn’t have a way of showing the score to the paying customers.